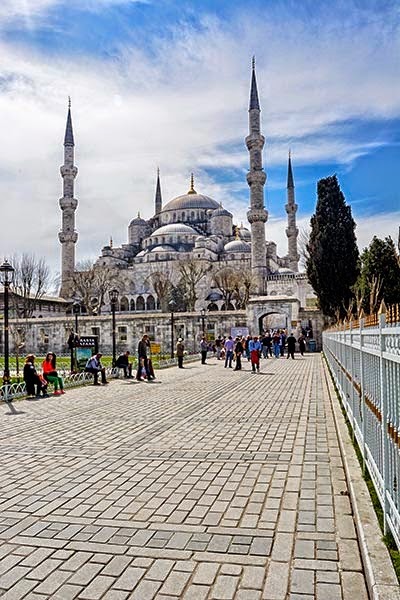 Is The Blue Mosque Blue? 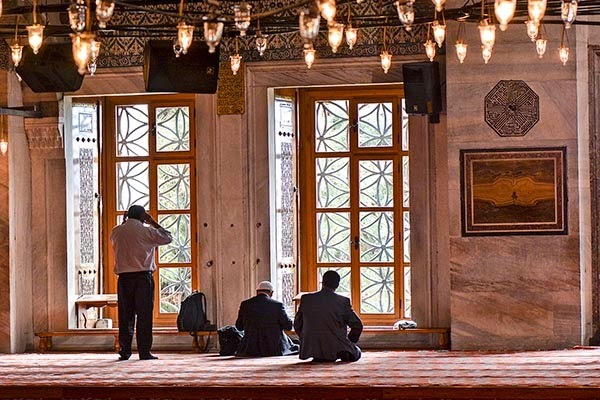 The mosque is one of the defining features of Istanbul’s skyline and a World Heritage Site. 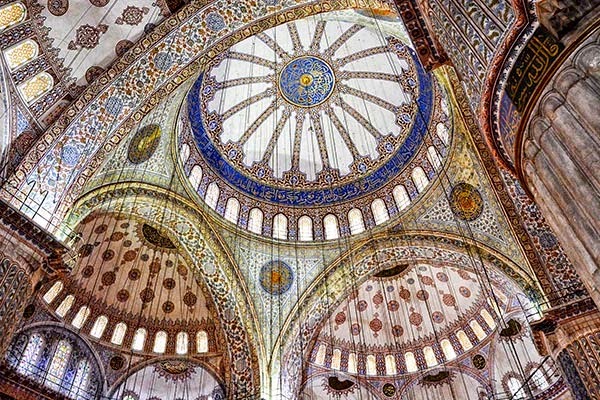 Sultan Ahmet Cami (pronounced ja-mee) is better known as the Blue Mosque but is it really blue? Entering the huge hall, your breath is taken away. However, it is not a blue breath. Blue is not even a dominant colour. 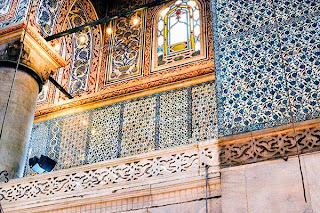 Except for the blue background of the calligraphy, don't expect to see blues as rich as the spectacular emeralds of the Green Tombs in Bursa. Instead, there are many colours but they are muted. The light pastels and white spaces enhance the perception of peacefulness. You don't even register that this is a huge dome. Sunlight pours through the large number of windows in the dome adding to the feeling of weightlessness. 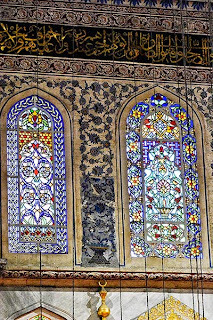 Glass was one of the inventions of the Middle East and Europe that travelled east along the Silk Routes to the Far East. 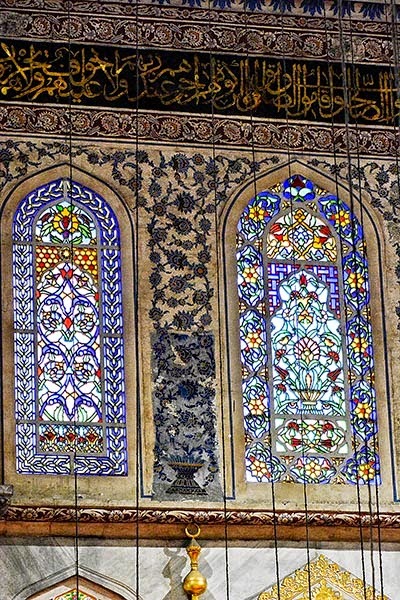 The coloured glass originally was a gift to the sultan from the Signoria, the government of the Republic of Venice. 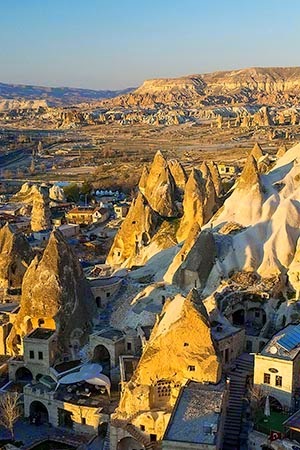 Venice went from Byzantine province to naval powerhouse, from trade funnel between Asia and Europe, to the third largest city and patron of art in Medieval Europe. But don't expect to see exquisite Venetian glass, which has mostly been replaced by panes of lower artistic quality. Sinan, married Byzantine to Islamic architecture. 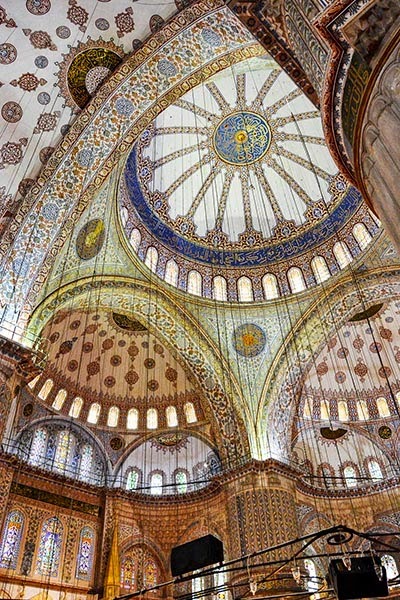 The windows were clearly copied from the Byzantine Church of Hagia Sophia Dome-ination. The dome transforms into spherical pendentives copied from Süleymaniye Mosque, Sinan's masterpiece. 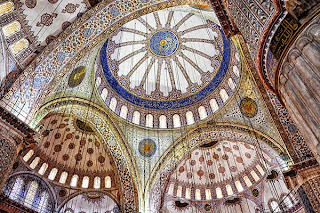 The central dome rests on four massive fluted columns often called elephant feet. 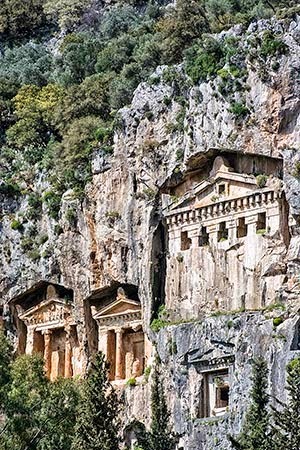 This allows for a huge central space without the use of arcades of columns as in the Ancient Roman or Medieval basilica. 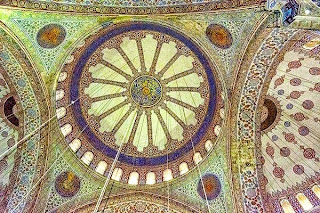 Cascades of domes seem to spill down from the great central dome. After removing your shoes, tourists must enter the south door. 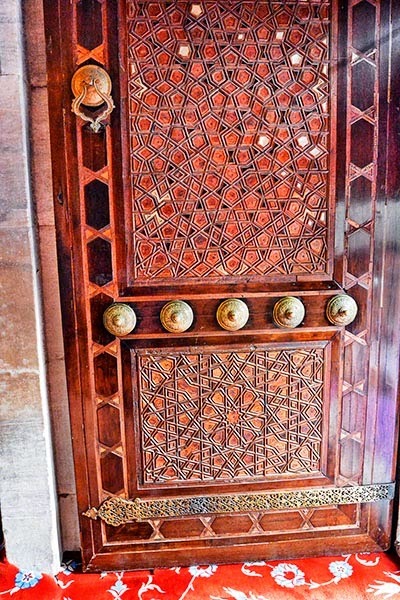 Pause and enjoy the typical Islamic patterns carved into the rich dark wood. The predominant Sunni sect is still adamantly opposed to images of sentient beings. 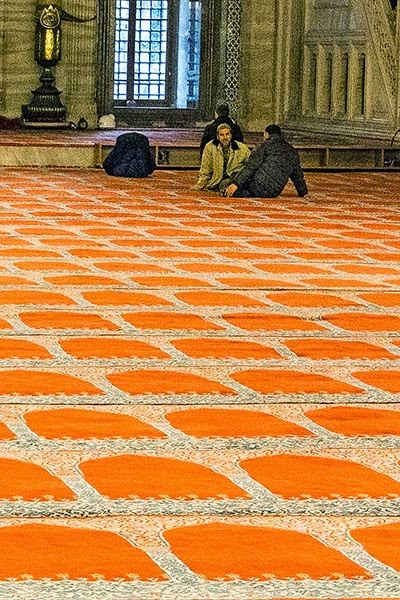 Images of any kind – animal, human or God – are not allowed in mosques. The reason for this is that Islam strived to end pagan worship that existed in Saudi Arabia. 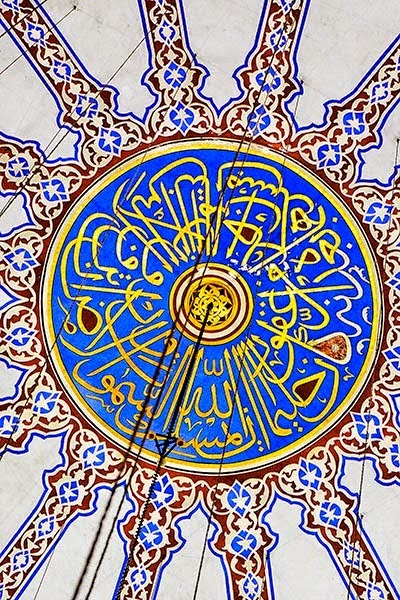 As a result, Islamic artists became masters of geometric patterns and calligraphy. 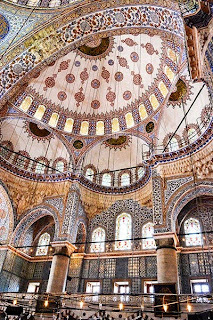 Symmetry and harmony is at the heart of Islamic art. The patterns are not random. 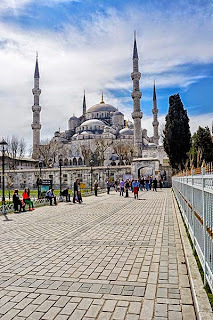 Finally, we solve the question of why this is called the Blue Mosque. 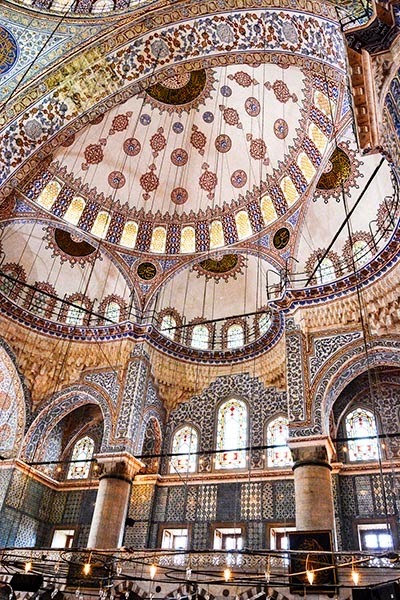 The interior is lined with more than 20,000 handmade İznik ceramic tiles that are famous for the colour blue. 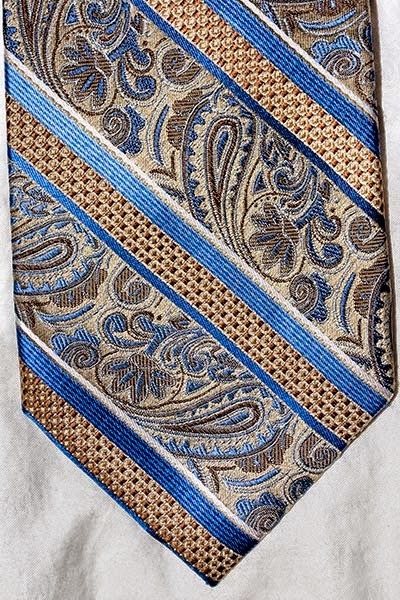 However, they are still not a saturated blue. 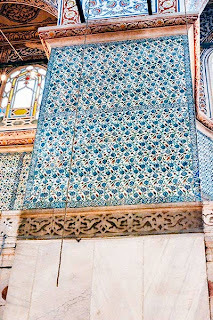 The tiles have brilliant green and turquoise hues as well as blue and white. 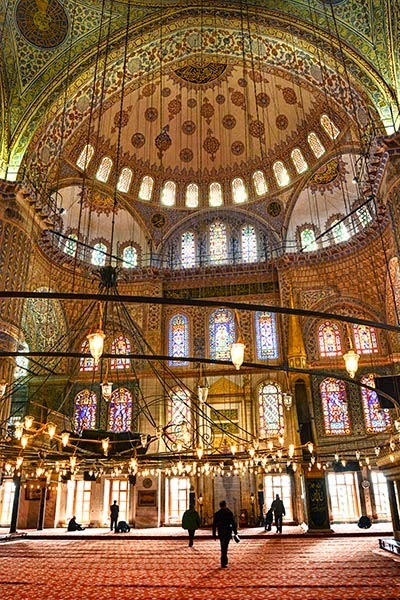 ﻿﻿The tiles are mostly in the inaccessible upper galleries. Tourists are restricted to a small and separate area in the back of the ground floor. 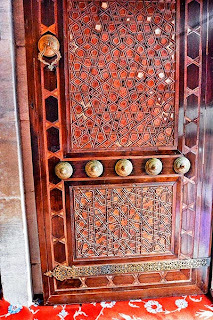 You cannot walk around the hall nor climb to the upper galleries. This means you need binoculars or a zoom lens to see the tiles. 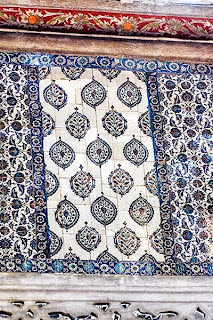 The tiles display more than fifty shades of tulips, which came to Europe from Turkey. ﻿The tiles at lower levels are traditional in design, while the gallery tiles are full of flowers and fruits. 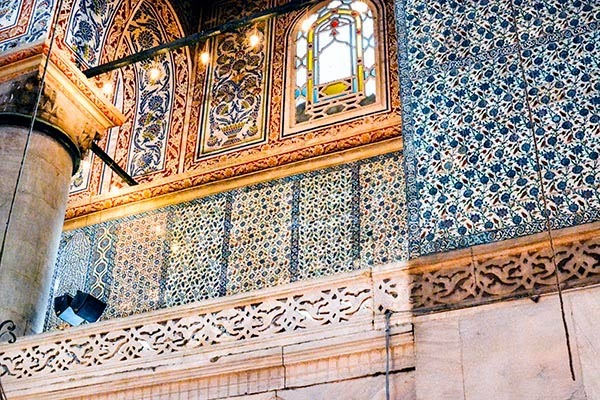 For close up views of Iznik tiles, visit the Tile Kiosk in the Istanbul Archaeological Museums. 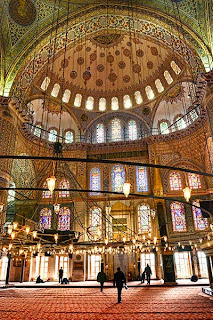 To the right of the mihrab is the richly decorated minbar (pulpit) where the imam stands when he is delivering the Friday sermon. The floors are covered with carpets, which are donated by the faithful and are regularly replaced as they wear out. 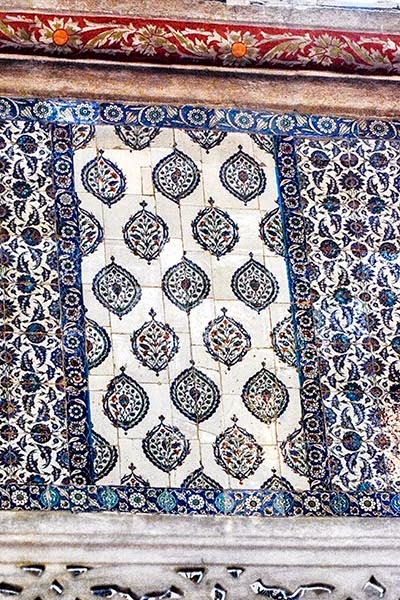 Each pointed arch design in the rug marks a spot for a worshiper. Islam requires all Muslims to pray five times a day (salat). Find out the times in advance and be aware that they close the mosque to tourists 45 minutes before these times. You could be waiting a long time. 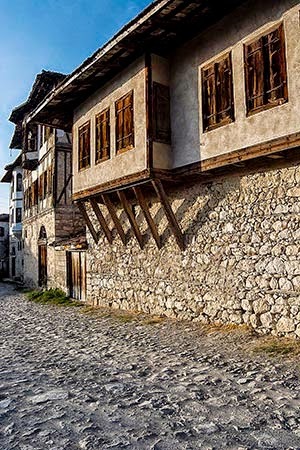 In this case, look around outside as well as down the streets to see the south and west facades. However, Islam is not the only religion with this practice nor did it invent it. Mohammed borrowed Jewish and Zoroastrian traditions. The Judaic custom of praying three times a day (facing in the direction of Jerusalem) was originally introduced by the patriarchs Abraham, Isaac and Jacob. These patriarchs of the Torah (Old Testament) are also patriarchs in Islam. ﻿Zoroaster lived in Ancient Persia but the dates are unknown. It has to precede the period when Zoroastrianism became the dominant religion between 6th century BC and 6th century CE. His real name was Zarathustra but he was called Zoroaster by the Greeks. Elements of his philosophy travelled to the West through Judaism and Greek philosophy (Heraclitus). There are still believers today. 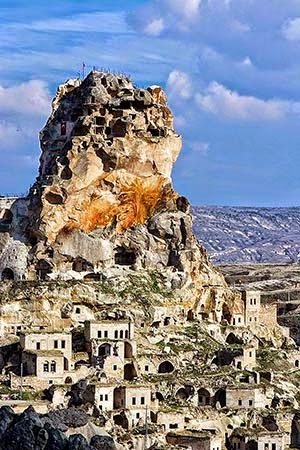 Zoroaster grew up with the Indo-Iranian pantheon, the same pantheon described under the PIE (Aryan) religion in the Dalyan and the Lycian Tombs post that was the basis for the Ancient Greek, Roman and Hindu gods. Zoroaster dramatically simplified this pantheon into a dualistic monotheism with two forces (essentially good and evil) under one God. 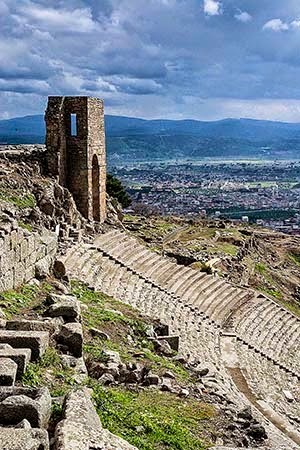 Mithraism (another PIE-based religion) and its’ descendant, Zoroastrianism, were the major competitors as well as influencers of early Christianity. 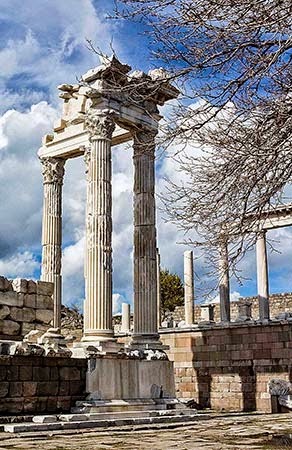 See the Patara and Saturnalia post for examples of the incorporation of local customs to get people to adopt a new religion. The impact of Zoroastrianism can even be felt by modern Western civilization. 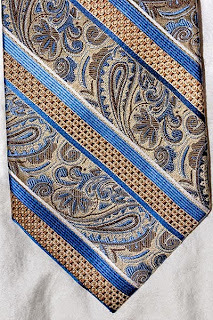 The paisley ties and textiles are not from Scotland or Kashmir; they are from the boteh motif of Ancient Persia. 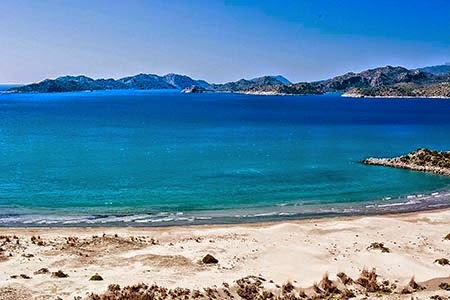 It was part of the Persian inheritance from the Aryans. In fact, Iran means land of the Aryans. 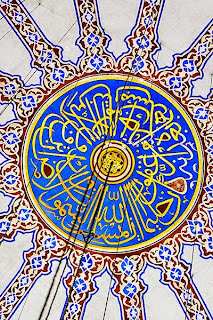 ﻿﻿The twisted raindrop (boteh) is the quintessential metaphor of the confluence of Islamic art and Zoroastrian symbolism. It originally represented the upright cedar tree that Zarathustra planted in paradise bent by the Muslim conquest of Persia and decorated with Islamic floral motifs. Boteh originated in the Sassanid Dynasty (224 - 651), the last dynasty of the Persian Empire before Islamic rule. 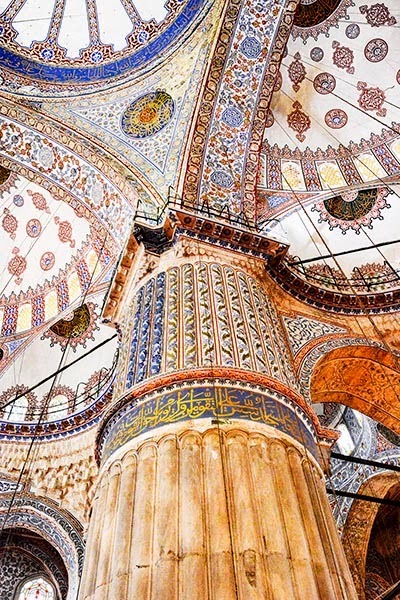 In fact, much of what became Islamic culture was transferred from Persian art, architecture and customs. Zoroastrianism, the national religion of Sassanid Persia, thus had a major influence on Islam. One Zoroastrian tradition was to pray five times a day. 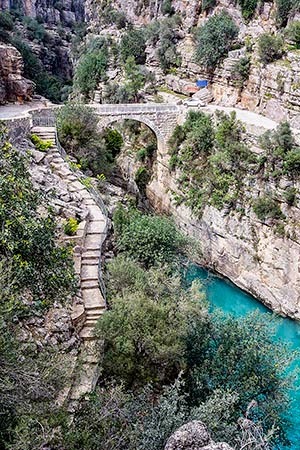 Another major Zoroastrian concept is that man had free will to choose his own path between good and evil, heaven and hell. This is the basis of all Abrahamic religions – Judaism, Christianity and Islam.